Istanbul’s world class BRT, pedestrianized spaces, and strong demand for improved cycling infrastructure highlight the rise of sustainable transport in the city. Photo by Monique Stuut/Flickr. Istanbul began implementing its BRT system, Metrobüs, in 2007. According to EMBARQ’s 2013 Social, Environmental, and Economic Impacts of BRT Systems study, about 600,000 people use Metrobüs each day. This number is likely growing, as Hayri Baracli, previous Director General of Istanbul Electric Tram and Tunnel Company (IETT) more recently stated that the Metrobüs carries 800,000 people daily, making it among the more heavily used BRT systems in the world. The Metrobüs is particularly important in providing access to transport for lower- and middle-income groups in Istanbul, who make up the largest proportion of its users. According to the previously mentioned study, the total net present benefits of the Metrobüs system are worth TL 11.4 billion (US$ 6.4 billion), and the benefits exceed the costs by a ratio of 2.8 to 1. This cost-benefit analysis accounts for the public and private costs to society as a whole. For example, benefits include savings in travel time for BRT users and others, improved road safety, and decreased exposure to local air pollutants, while costs include infrastructure, equipment, maintenance, and operations costs. By shifting from other modes of transport, Metrobüs users can save 28 days per year in reduced travel time. By reorganizing and consolidating informal transit and conventional buses, Istanbul’s Metrobüs system is estimated to reduce CO2 emissions by 167 tons per day, and more than 240 ton-liters in total. About 50,000 vehicles are removed from traffic each day due to the Metrobüs system. This is especially important given that Istanbul is one of the most congested cities in the world. 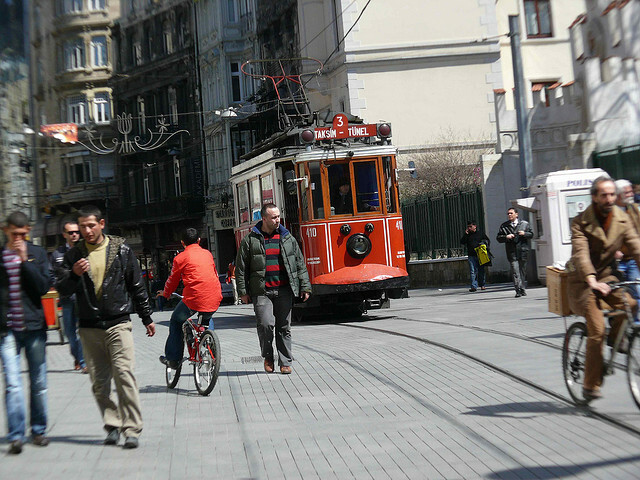 Between 2010 and 2012, Istanbul pedestrianized 295 streets, barring access to all vehicles. This has had a wide range of benefits, including improving safety and access to public transport by foot and decreasing air pollution within the pedestrianized areas. Further, EMBARQ Turkey’s survey of business owners and managers within the pedestrianized areas found that 78% of respondents said they were pleased or very pleased with pedestrianization, and 56% expected their sales to increase. After witnessing the positive impact of pedestrianization in the region, the Laleli Industrialists’ and Businessmen’s Association (LASIAD) invested alongside the municipal government in the pedestrianization of the At Laleli and Üst Laleli areas. According to a survey conducted by EMBARQ Turkey, 83% of respondents indicated that safe bike lanes should be implemented for all bikers. Istanbul is working towards an ambitious goal of having 1,000 km (650 miles) of bikeways as an integrated transport mode by 2023. As Istanbul improves cycling infrastructure, it is crucial for planners to choose routes carefully in order to integrate biking with other transport modes, define goals and increase biking’s mode share. Learn more about efforts to improve sustainable transport in Istanbul and cities across Turkey by visiting EMBARQ Turkey.